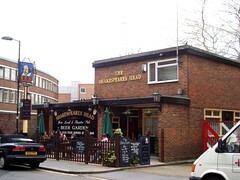 Locals' pub just south of Angel Station in Finsbury, round the back of Sadler's Wells Theatre. It doesn't look much from the outside, coming across as something of an estate pub. However, this place retains a lot of traditional charm without being in any way unfriendly. They even have a bell for the theatre performances and check with everyone so that no one misses the show. It can get busy at times, but never unpleasantly so. Real ales on tap are Courage Best and Directors Bitter (£2.70/pint), well-kept. There's also a range of standard lagers. There is a menu, very much standard pub food looking as if it has been unchanged for decades, but outside the food hours there are still plenty of hefty looking rolls and sandwiches available and kept in a display area alongside the bar. Ewan had a ploughman's lunch (£5) one Friday evening and found that it was quite substantial, with a huge chunk of cheddar, pickles, and salad (cucumbers, tomatoes, lettuce), as well as a good length of crusty loaf served on a separate plate with butter. Toasted sandwiches and cold food is a little cheaper, generally £3-4. There's a lovely large beer garden area in the back, with some tables under cover as well. Last visited by Ewan, Kerry and friends, 3 March 2011. Last edited 2013-05-10 08:01:05 (version 11; diff). List all versions. Page last edited 2013-05-10 08:01:05 (version 11).